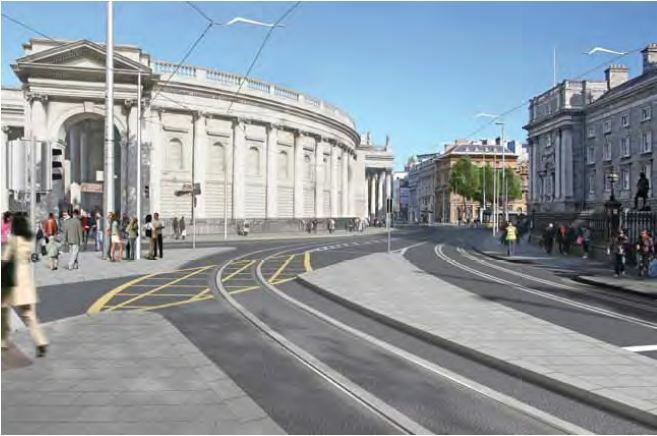 Luas Broombridge’s approval by the planning body, An Bord Plenala, last week means that railway tracks are coming to many of the main streets in Dublin City Centre — including O’Connell Street, Parnell Street, and College Green. According to the 2011 census, among commuters from the Dublin City Council area, cycling is growing in popularity and is now the primary mode for 7.5% of commuters, up from 5.6% in 2006. Morning rush hour traffic counts also show a 45% increase in the amount of cyclists entering the city centre in the last five years. The amount of cyclists on Dublin’s streets is set to keep growing and the city wants cycling to account for 20-25% of all trips by 2020. So both the council and the RPA should be planning for more cyclists on city centre streets. 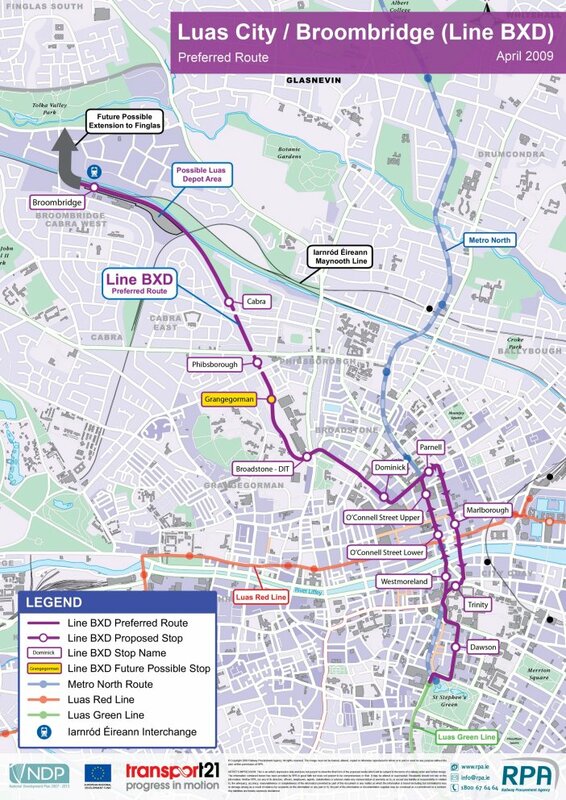 So, what does Luas Broombridge (BXD) mean for cyclists? We don’t fully know. There’s little to no provision for cycling in the plans for BXD drawn up by the RPA. And while cycling is officially seen as important in city policy, and An Bord Pleanala is supposed to take into account of that policy, but An Bord Pleanala did not include any conditions in relation to cycling. An Bord Pleanala have left it up to the city council and the Railway Procurement Agency (RPA) to sort it out between them. What should we expect? There’s a very mixed record of providing for bicycles around Luas lines, but the RPA and the council should (hopefully) be aiming to avoid past mistakes. St Stephen’s Green: The council has outline plans to allow cyclists to go in both directions around the green — Luas BXD plans should allow for this on the west and north sides of the green. 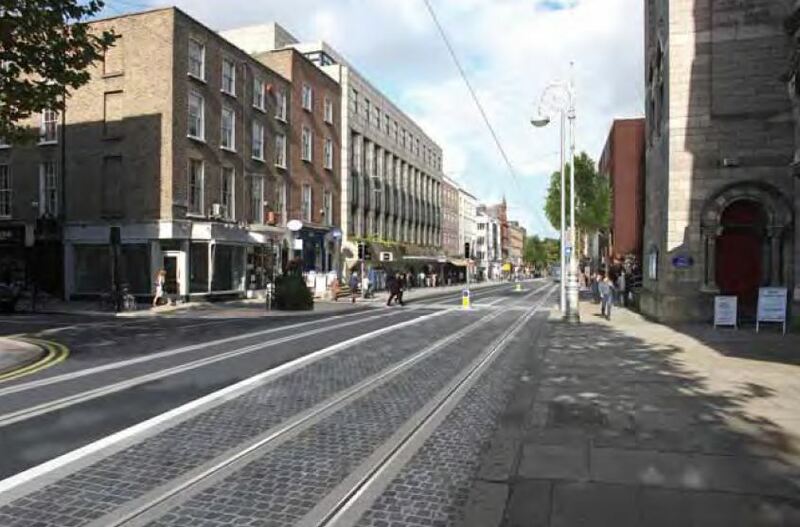 Dawson Street: Will tram tracks be more attractive than the near by large one-way street? Dawson Street: The RPA should consider facilitating cyclists going southbound on Dawson Street — this means more shared space for trams, but it’s a good deal better for trams than ending up sharing the line with cyclists illegally using the tramway southbound for the full length the street. Like the red line, using the tram tracks may be a lot more attractive to many cyclists than using the busy, large one-way streets in the area. Dawson Street / Molesworth Street: Cyclists should be allowed to continue to exit Molesworth Street and turn right onto Dawson Street — the Railway Order drawings shows it as changed to one-way for all traffic. Given that the go ahead has not been given to the northbound platform stop opposite Molesworth Street and given that allowing cyclists to make this turn is relatively simple and not very disruptive compared to allowing all traffic make the turn, it seems like there are no strong reasons not to plan for cycling here. Dawson Street / Nassau Street: The loss of the right turn from Dawson Street to Nassau Street seems acceptable given the lack of space, how busy the street is, and that there is a close by alternative. Nassau Street: While extra footpaths space is needed given how busy footpaths are in this are, it could be beneficial to keep some of the planned extra footpath space as road surface so cyclists can keep inside the left-hand rail in both directions. This would likely decrease the amount cyclists have to cross tracks which is a benefit to cyclist safety and decreases the chances of slowing down trams or buses. Nassau Street to College Green via Grafton Street: Which sounds more pleasant: (A) follow the Luas track along Nassau Street > Grafton Street (the bit currently open to traffic!) > College Green where you can be sure the Luas driver will see you OR use the current congested route (B) go from Nassau Street > Suffolk Street > Church Lane > College Green with buses and coaches turning in and out of stops and hardly fitting down the hill at Church Lane? The RPA should plan and allow for cyclists to travel northbound from Nassau Street to College Green via Grafton Street along the tracks. College Green: Because of the planned tracks and road narrowing at points, the current design may result in increased conflict between cyclists and public transport. The mix of trams, buses and cyclists will slow down all modes. Very little likely can be done to fully segregate all modes in all directions at College Green, however, on the Bank of Ireland side, the RPA and council should consider removing one traffic lanes and using this space to both widen the footpath (which is a contender for the busiest footpath of its size in Dublin) and putting in a cycle lane / track (at road level). College Street (beside the Trinity Stop): Going by the photomontage and outline drawings: The lack of space given to cyclists on the road beside the stop is highly questionable given the apparent large size of the traffic lanes and the sizes the NTA says is needed for bus and traffic lanes. Westmoreland Street:It’s not clear what if anything is proposed while waiting for Metro North. Improving this street for cyclists while work is planned for BXD seems to be good idea — at the very least, an advance stop line / box should be provided before O’Connell Bridge. 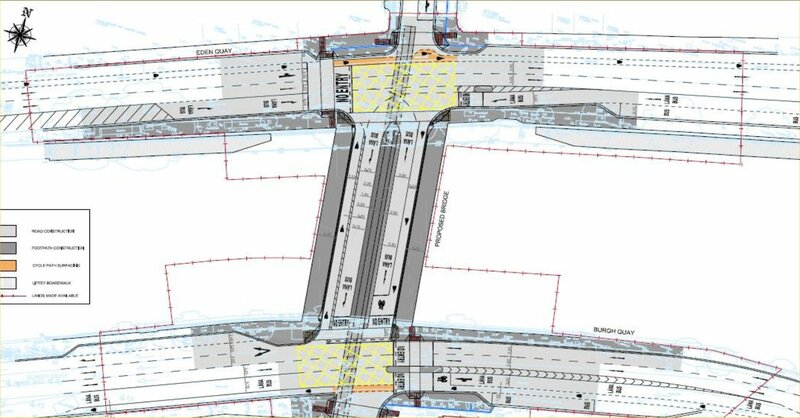 O’Connell Street Lower: The planned removal of the cycle lane on O’Connell Street northbound as shown in the Environmental Impact Statement could increase chances of Luas-bicycle and Luas-bus conflicts — as shown along the current mid section of the street at the GPO, where cycle tracks are missing, motorists drive in different parts of the lanes and this increases the chances of cyclists weaving in and out of traffic trying to get around congested traffic. This has the potential to increase conflicts with Luas. O’Connell Street Lower: O’Connell Bridge to Prince’s Street: Given bus stops have been removed along this section it should be of benefit to put in an improved cycle lane/track. This should re-enforce the clearway and reduce the above mentioned conflicts. A solid white line should be used for the cycle lane, and it may also be worth looking at using flexible bollards, as used southbound near O’Connell Bridge. O’Connell Street crossings at stops: At/opposite Prince’s Street, the current pedestrian crossing and the central median around it is used by the many cyclists (both dismounted and wrongly mounted) taking out or leaving back Dublin Bikes, and those using the extensive bicycle parking on Prince’s Street. A planned Luas stop is located on the median at this point, with a slightly relocated crossing. Nothing should be done to accommodate the illegal use of the crossing, but the width of the crossing should take into account of many people crossing walking with bicycles. On O’Connell Street Upper, northbound, the right turn onto Cathal Brugha Street is to be removed. Given this movement is also not allowed at the top of O’Connell Street, this can be viewed as a severe restriction on permeability. Allowing cyclists to make this right turn while mounted should be looked at. Parnell Street/Square: The city council already has plans to allow cyclists to travel direct from the west side of Parnell Street to the east side past using a contra-flow lane; and for cyclists to be able to go from O’Connell Street northbound to a contra-flow on Parnell Square East — making provisions to allow these movements should be seen as a highly important. Not only is it important for the increasing amount of cyclists using the city’s streets, but it will be also important to minimise cyclists-tram conflicts and minimise illegal use of the tramway. Dominick Street: Dominick Street will form a very direct link between two parts of DIT (Grangegorman and DIT Bolton Street, which is remaining in place), it will also form a direct link from Grangegorman to the north city centre core. There area already many one-way systems in the area and the alternative routes are of poor standard and — like on the red line — cycling on a tramway will look attractive to many. Without exact measurements it is unclear if cycling both ways could have been provided for along with the tracks on the street and access for motorists. Western Way and Palmerston Place: Regardless of if the last point, a cycling link in both directions on on Dominick Street Upper, between Western Way and Palmerston Place, can be put in place without any impact on the current track designs. It could be viewed as senseless not to put in such a link as park of the Luas works which will cut off the current road. North Circular Road / Cabra Road bridges: Both of these roads are busy roads and narrowing of cycle lanes may increase the chances of motorist-cyclist conflicts. Given this: [A] a more shared ticket area / footpath environment, OR [B] minor bridge widening, should still be considered, even at this stage of planning, rather than the current plan of widening footpaths using the road carriageway space. Widening the footpaths at the bridges with a reduction / removal of the cycle lane on the North Circular Road and blocking any chance of a future cycle lane on the Cabra Road seems to go against city council policy, including the Phibsborough Local Area Plan (a part of the city development plan). North Circular Road: The current cycle lanes are small but are of high value, especially eastbound, where the cycle lane allows cyclists to bypass the often heavy to gridlocked traffic in that direction. 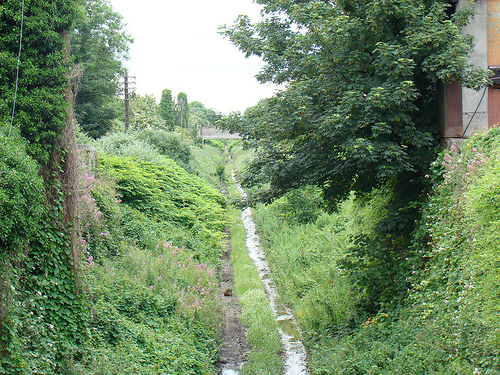 Cabra Road: As with the North Circular Road, the railway cutting bridge and the approaches to it on the Cabra Road, as it currently stands, already represents a narrowing of the road. Like most national roads within the M50, the road has been declassified, but much of the traffic on the road is still long distance or at least well outside the city boundaries (ie Dublin 15 and beyond). If cycle lanes are not an option and further road narrowing is to go ahead, the National Cycle Manual option of using large “Cycle logos in centre of lane to emphasise correct cyclist position” should be considered (under the heading ‘link types’, see section 4.3.1 Mixed/Shared Street – Wide Shared Street). Broadstone railway cutting: The RPA view that the railway cutting and its road bridges are too narrow for a cycling and walking path seems to be correct, at least for the most part. The current pinch points around the North Circular Road and the Cabra Road would not allow for any meaning full walking/cycling route and also fit the Luas tracks. Cabra Stop: Given the ample room in the railway cutting at this stage, and the ramp access, the RPA should at least leave space for normal bike racks and secure bike boxes (of the kind recently provided at a number of train stations and current Luas stops), if not provide both from day one. Broombridge Stop: Given Broombridge is known for its anti-social behaviour, moving the bike racks closer to the platform should be considered — where passive and active security can be maximised — and secure bike boxes would be of benefit from day one. Broom Bridge: For better access to the Luas stop, train station, and canal, the council should consider reverting the road on the bridge and those leading up to it to two-way for all traffic, possibly using traffic lights. If this is not desirable, contra-flow for cyclists only should be considered. Exactly how cycling friendly the route will be is up to the RPA and the city council. Will history repeat it self? I can’t help viewing Luas as nothing more than an expensive way (capital cost/km) to move commuters but at the cost of extinguishing what were public rights-of-passage for cyclists on these streets. Cycling is almost wholly non-polluting and cheap in comparison to Luas’ embedded- and running-energy costs. Roads Authorities have to consider the needs of ALL ROAD USERS under the Road Act 1993. The NTA/RPA/Dublin City are collectively a ‘road authority’ in this context. They are required to state what their provision is for cycling along the alignment in my view in advance of works commencing. Our existing rights-of-passage must not be extinguished. We are silent, clean and green in operation. Very interesting analysis, if they did what you said they should it would be not bad but they never really have done up to now. As you say they have nothing down on paper as regards Cyclists. 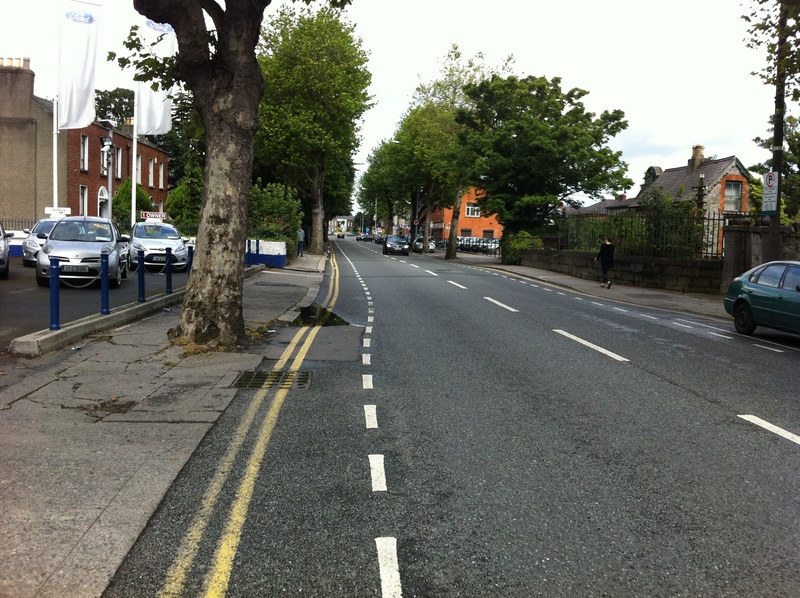 They will do it the easy way in order to look after Luas and Motorists and the Cyclists will be just an afterthought. We have seen the bad planning in regards to that Sam Beckett Bridge, They designed the Bridge for the benefit of Motorists and then decided to put in Cycle tracks. The Cycling organisations will have to Hound them until they design things correctly so that it will benefit Cycling. I dont think they have a clue about what they are doing,they seem to want to pander to motoring interests all the time. Dublin City Centre is for public transport and pedestrians, not cyclists.